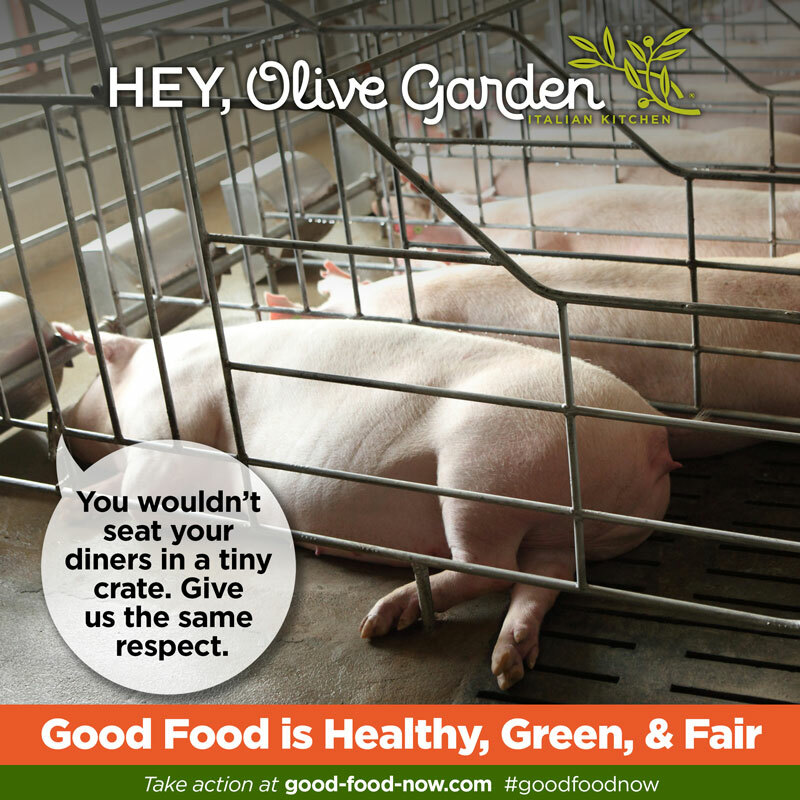 TELL OLIVE GARDEN’S OWNERS TO SERVE GOOD FOOD AT ALL THEIR RESTAURANTS. 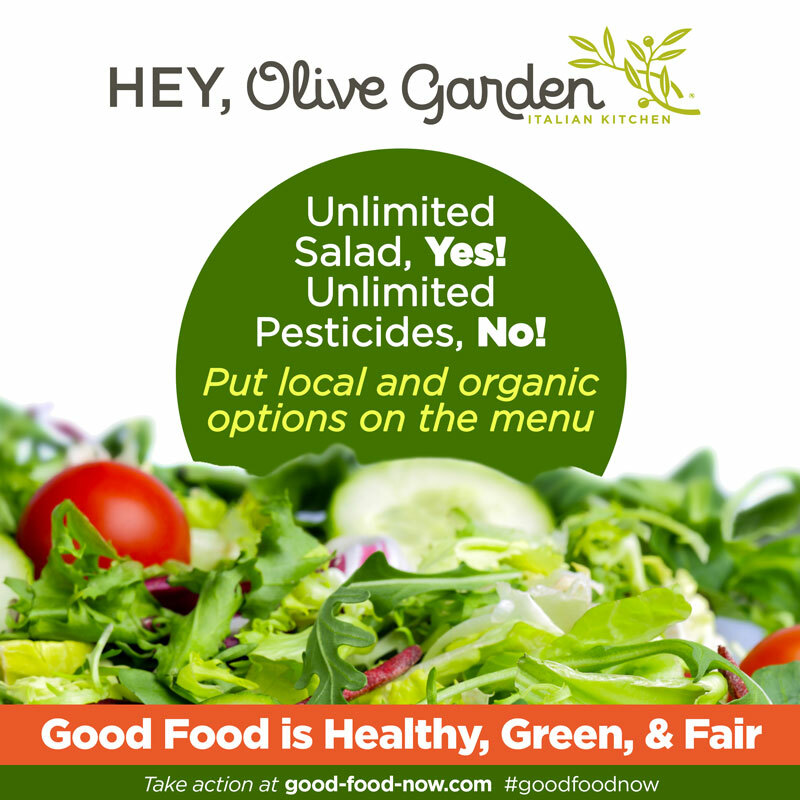 Olive Garden claims to serve "nutritious, high-quality and responsibly-sourced food," as well as boasting environmental responsibility, employee support and giving back to the community. Yet, the company’s actions and sourcing practices fall far short of its rhetoric. 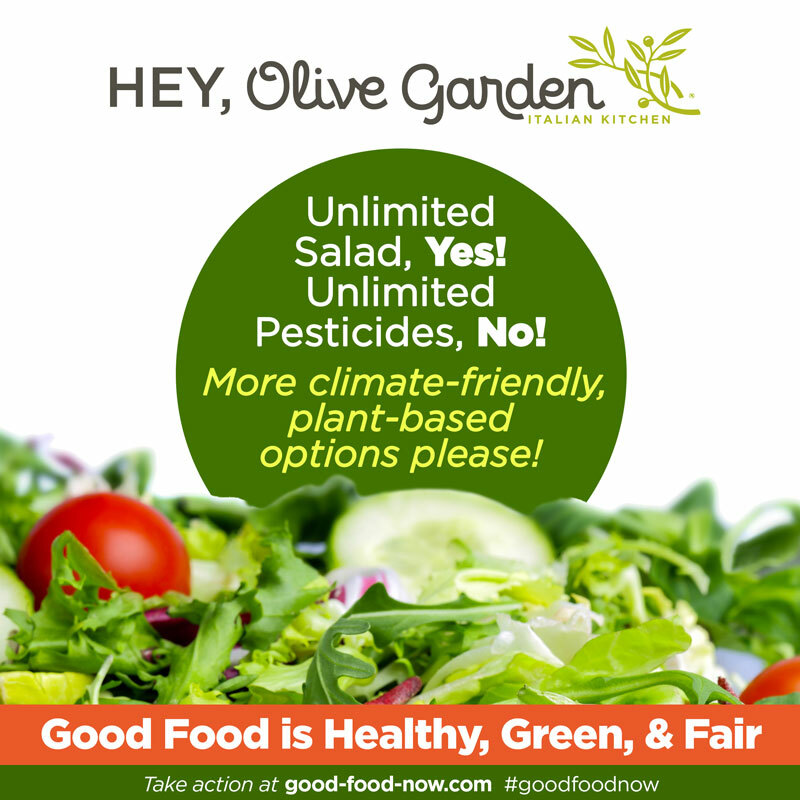 Call the company today to demand they serve food that's better for people and the planet. Calling instructions: Call 1-800-331-2729 Monday through Friday between 10am-4pm EST and press 5 to speak to a customer relations operator. 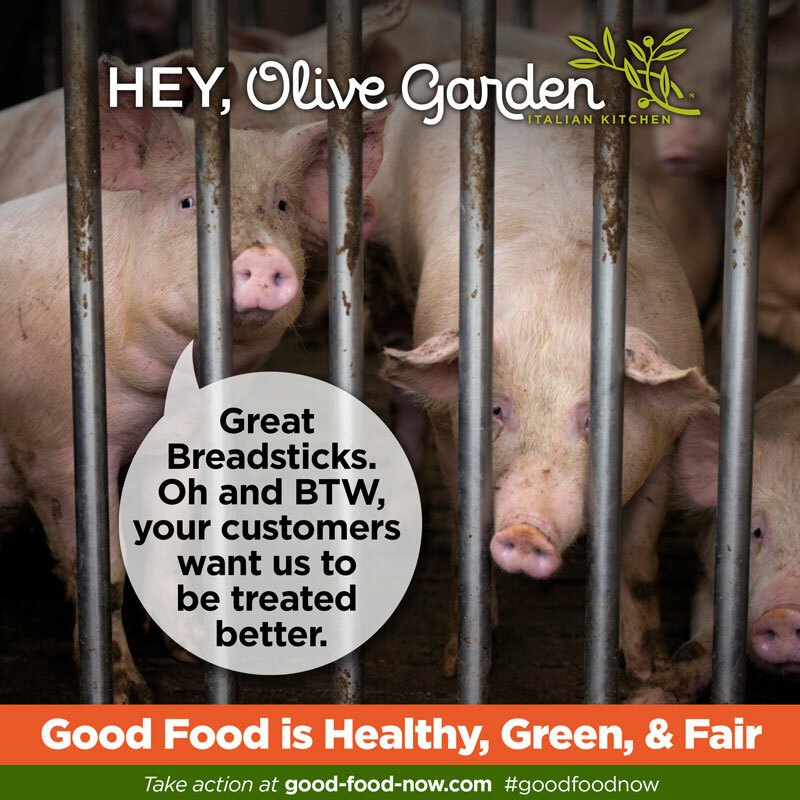 Once you've placed your call, let us know the company’s response by emailing info@good-food-now.com. • I am really concerned about the impacts of factory farms on the environment and public health. I’ve read that some of the meat and dairy you serve comes from suppliers who use antibiotics regularly, even when animals aren't sick. I urge you to serve less meat and dairy, and when you do serve it, support farms that only use antibiotics if the animals are sick. 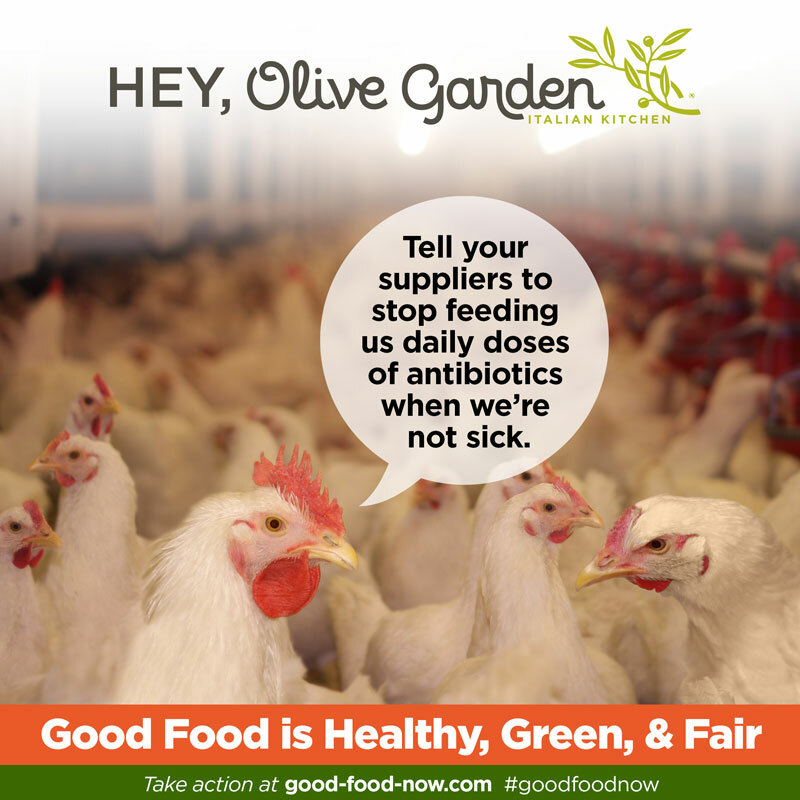 • Responsible antibiotic usage is important to me, and so is the treatment of animals and farmers. Instead of pumping animals full of unnecessary antibiotics, ask your suppliers to give them what they really need—more space, and a cleaner, healthier environment. 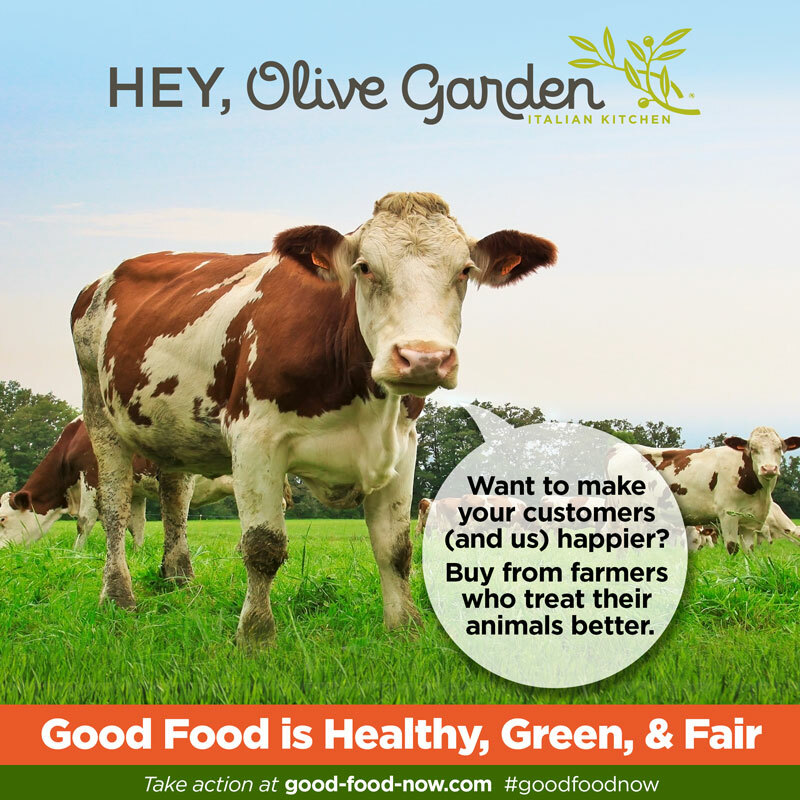 • I would love to see more local and organic food on the menu, especially food that comes from smaller, local, independently verified humane farms. I’d also like more main dish options without meat and dairy. 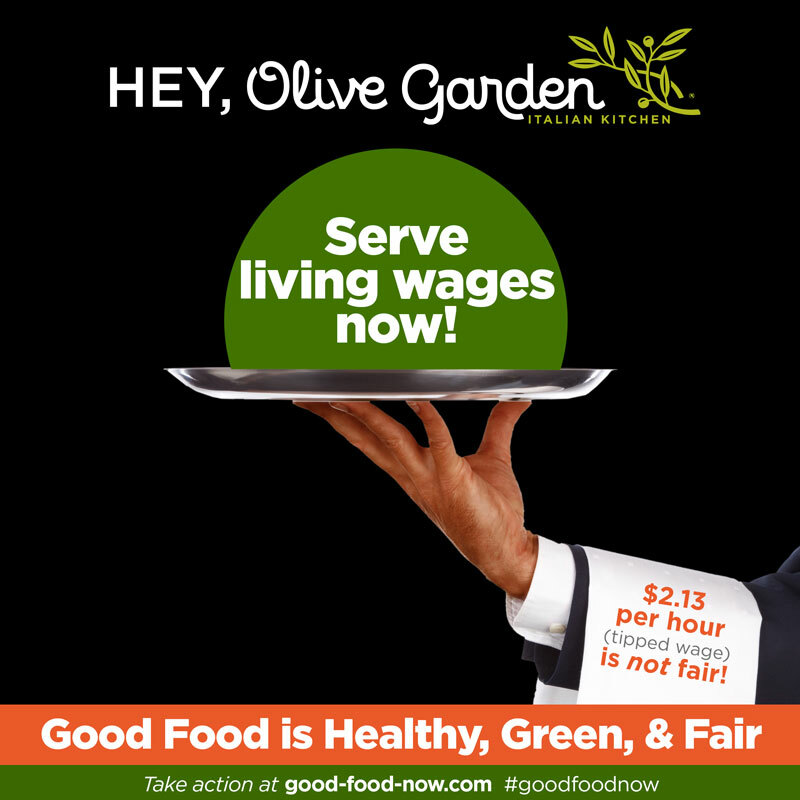 • I was shocked to learn that some Olive Garden servers earn just $2.13 per hour and many earn just minimum wage. These workers are part of my community, but with wages this low, they cannot support themselves or their families. 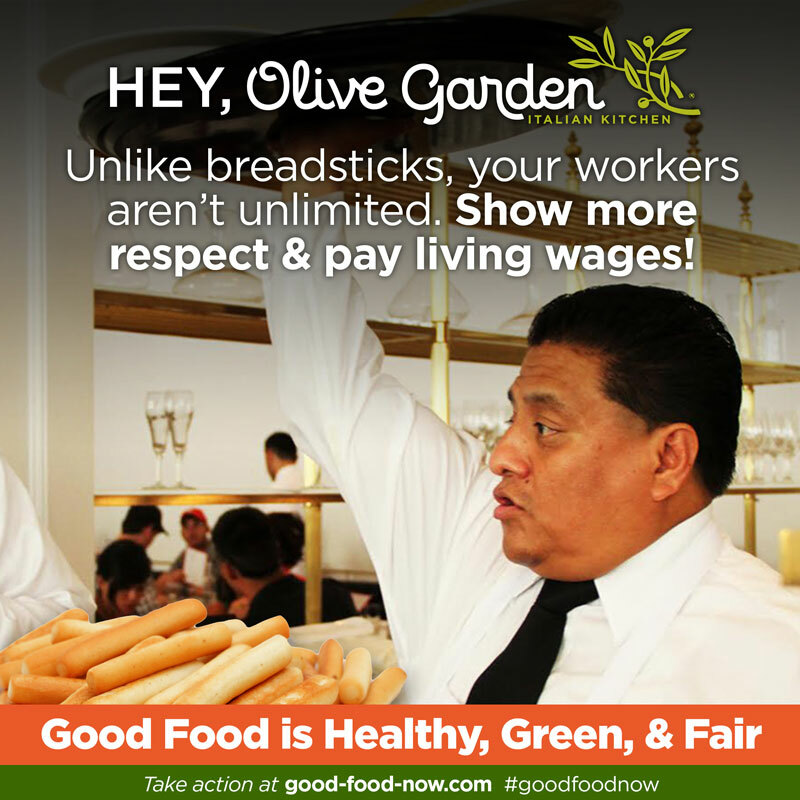 If Olive Garden wants its customers to feel like family, you should pay your workers fair wages and offer paid sick time. Share the Good Food Principles. 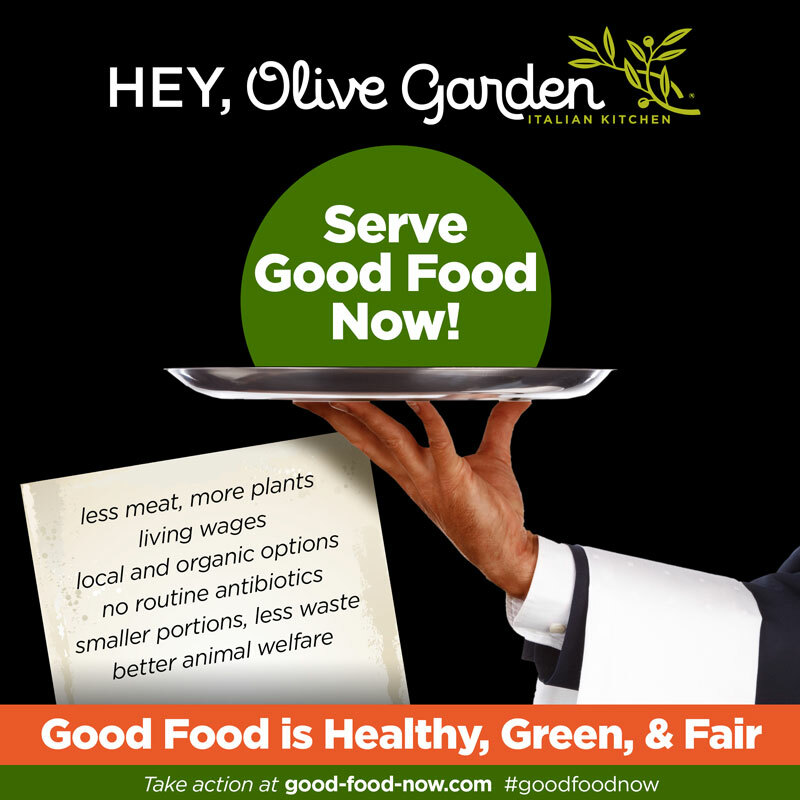 Darden Restaurants owns and operates more than 1,500 restaurants worldwide, including Olive Garden. Through its popular restaurant chains, the company employs 150,000 people and serves more than 320 million meals a year, making Darden Restaurants our nation’s leading casual dining operator and a major influence on our food system.